The extra downside I spoke of has come and with it the very real possibly of a new Investor Cycle. We never know until a Cycle is confirmed, but the action last week has a really strong chance of having marked a DCL and ICL. We’ve had a number of massive capitulation selling days in this Cycle, but this was the first time it was accompanied by a bullish reversal late in the day. This type of action really does leave the taste of an ICL behind. 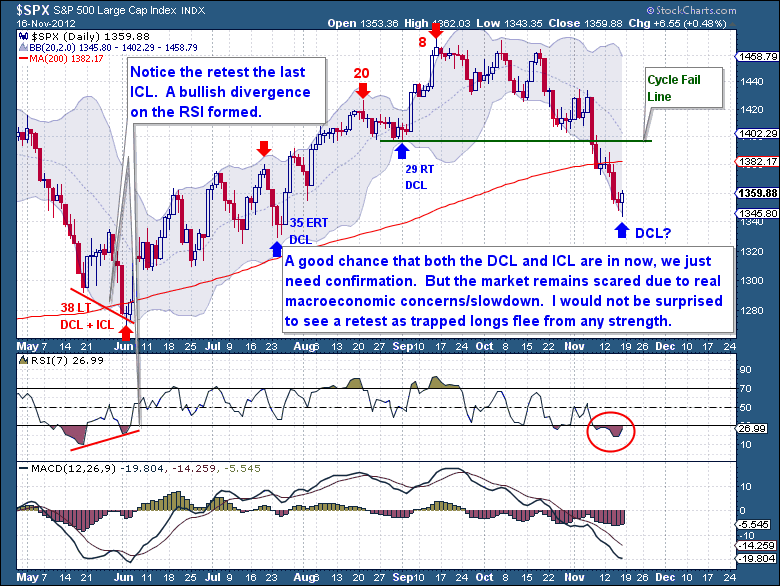 Besides the “ICL behavior” witnessed on Friday, the Daily Cycle is really oversold and extremely stretched. I know in trading it can always get worse, but this decline should have run its course now. We should know by early next week if this is a new DCL and ICL as we should expect to see a good follow through rally. But I am concerned about Equities; you all know that I believe a massive drop into a 4 Year Cycle Low is still ahead of us. To date the natural 4 Year Cycle has remained elevated purely due to the efforts of the Federal Reserve. But it’s more than clear now that the world economy will not hold up despite what the FED does. Europe is now in a confirmed recession; just months after the bureaucrats denied the possibility and were openly talking about new growth. The recession calls in the US too have fallen on deaf ears, only a few are brave enough to call a recession (I called one). Of course confirmation of a recession won’t come for a long time, but the latest slide in Q3 earnings, production, and employment numbers clearly show that we’re dangling on the edge of recession. This is very important because every 4 Year Cycle has coincided with a recession. Cyclical bull markets end because the underlying fundamentals can no longer support the overly optimistic earnings growth that “analysts” have priced into their models. You see the fundamentals do matter in the long run; they always have and always will. Once the economy cools, earnings begin to come in soft and you go from projecting out future earnings growth to suddenly talking about earnings contraction. This “suddenly” creates a significant gap between estimates and reality. This event is never priced into any of the valuation models and is one of the reasons why the 4 Year Cycle declines are always much more severe than the rally. Recessions “appear” to come quickly and for some reason “surprisingly” to most people. I don’t know what exactly the VIX is trying to tell us here, but this measure of fear is certainly not lining up with past ICL expectations. We just went through a 140 point S&P drop and the VIX never printed above 20. What’s more confusing is that it has been going down in the past few days. Although I can’t immediately explain this significant divergence, I believe it must be taken as a warning. For me the lack of fear shown by the VIX could be telling us that the declines are not over. I don’t necessarily mean right now within this Cycle, because I see this Investor Cycle finding a low here. On the Weekly chart, Friday’s decline below 1,345 has confirmed a Cycle retracement of more than 61.8% and a series of technical indicators now deep into ICL levels. This along with the bullish reversal has me finally believing that a true ICL occurred on Friday. Until proven though, this is just my expectation based off the evidence on hand. We need to move above 1,388 to form a weekly swing low confirmation. 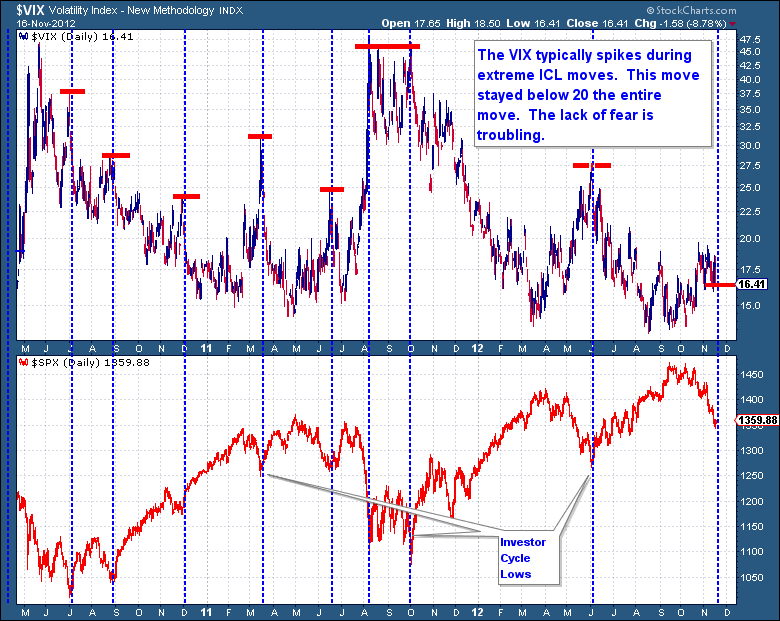 My point regarding the VIX is to be taken in context with my views that a 4 Year Cycle top is well overdue. I doubt the FED stands idle for too much longer with this level of sentiment and it’s their next move that should propel us higher in the next Cycle. But I maintain a belief that 2013 is going to be a very bad year for equities and when this cyclical bull market ends, we will move into a Cyclical bear market. This final “cyclical bear” market of this long running “secular” (2000-201X) bear market will likely be a relentless and multiple Investor Cycle decline. 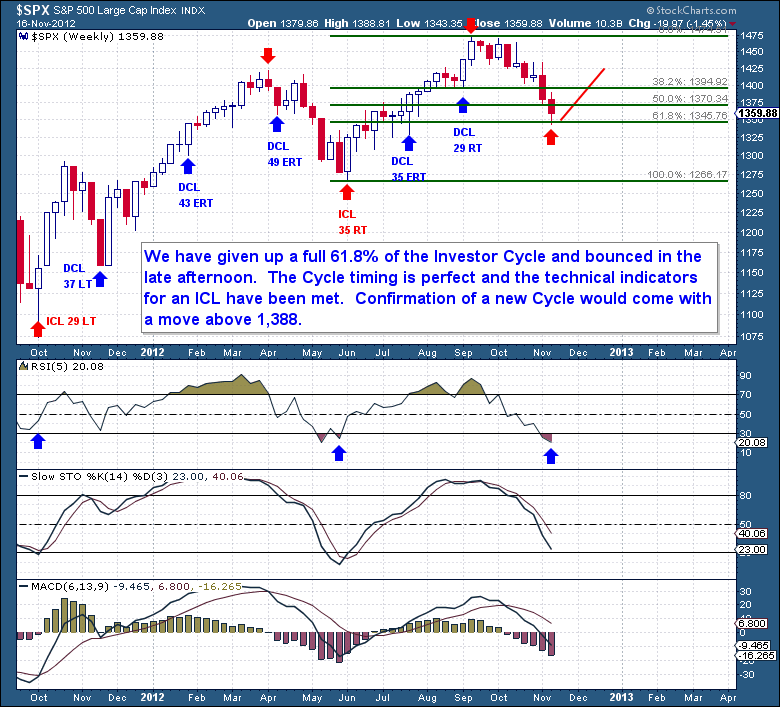 If this 4 Year Cycle has topped already, we will begin to see a series of Left Translated Investor Cycles. 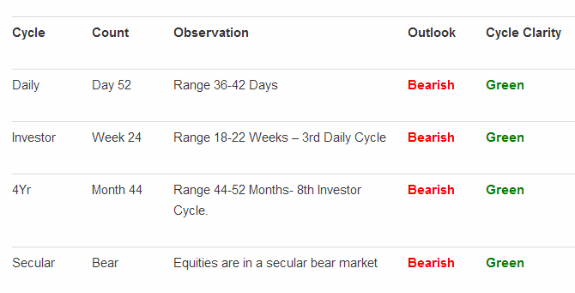 The Left Translated natures of Cycles are what create the declines in bear markets. If we have topped, then the coming Investor Cycle has a strong chance of forming Left Translated too. Such a Cycle would likely top within 8 weeks and quickly fall below this past Friday’s low, if that ends up being the actual ICL. This as is an excerpt from the weekend update (sent out on Saturday) from the The Financial Tap, which is dedicated to helping people learn to grow into successful investors by providing cycle research on multiple markets delivered twice weekly, as well as real time trade alerts to profit from market inefficiencies. They offer a FREE 15-day trial where you’ll receive complete access to the entire site. Coupon code (ZEN) saves you 15%.